Rosie Foreman prepares to switch on the lights with Santa, the Sandard Bearer and his attendants. The highly anticipated Christmas lights switch-on in Selkirk has been deemed a huge success by organisers and townsfolk alike. More than 300 people gathered in Market Place on Saturday afternoon to enjoy musical entertainment and welcome Santa to the town for the town’s first ever switch-on event of this kind. Excited youngsters in Selkirk on Saturday evening. The event was organised by Serkirk Illuminations, the group of volunteers behind funding the new lights and their installation, who were delighted to see that community spirit is still shining bright in the Royal Burgh. She added: “It was hard work getting to this point. People were a lot less interested last year. But we have had pop up shops, a duck race and a bingo night and have raised over £4.500 for the new lights which look great tonight. Caroline Penman with Santa in Selkirk. “There are so many people who helped get us to this point. People were really generous with their time, donations and support. Music came from Selkirk Silver Band, Riddle Fiddlers, Dere Street and Selkirk Amateur Operatic Society while Santa and his elves were more than happy to spend time meeting children and posing for photographs. Rosie Foreman, the winner of the school’s Christmas jumper design competition, was given the honour of switching on the tree lights ably assisted by Santa Clause and amid much excitement following the countdown. Selkirk Silver Band provide musical entertainment during the afternoon. “A special thank you to the Yarn Bombers for knitting all the extra decorations and the 2,000 pom poms which have decorated the town. “I would also like to thank all the volunteers who came along and helped put up the lights and the extra decorations. “Thanks to all the businesses who helped by donating money and donating their time and helped fundraise for the lights. Santa and his helpers arrive into Market Place. Youngsters in Selkirk wait for the switch-on. Rosie Foreman with her winning Christmas jersey design. 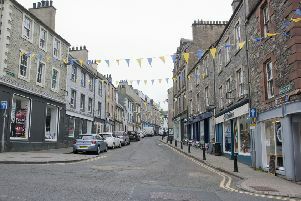 Selkirk shines following the switch-on. Santa greets the crowds in Selkirk. Local musicians provide entertainment before the switch-on. Fiona and David Deacon get in to the swing of things in Selkirk.